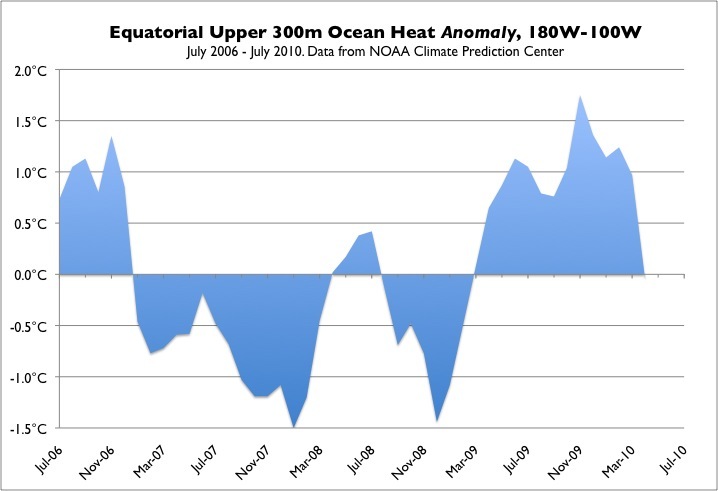 “The decrease in upper ocean heat content from March to April was 1C – largest since 1 | Wott's Up With That? “The decrease in upper ocean heat content from March to April was 1C – largest since 1979“. Dr. Roger Pielke Sr. tries on his deceptive “where’s the beef?” complaint about measurement of ocean heat content again. Phil Klotzbach from NOAA’s Climate Prediction Center has just reported that there has been a drop in the upper ocean heat anomaly. Actually, the Climate Prediction Center is only talking about the upper 300m of the ocean, and only in the eastern half of the Pacific Ocean. So Dr. Pielke is enthusiastically extrapolating well beyond his data while also carefully ignoring as much inconvenient data as possible. He even chooses to display only 12 months of data to prove the climate trend! That’s weather, not climate, and when denialists do this they’re usually trying to hide something. So we’ve got an non-significant time period and a global conclusion being drawn from a regional information. Even still the trend only applies to a cherry-picked subset (upper 300m) of that data! Everything else is waved away. We’re not watching Perry Mason at work here, are we? Doesn’t look like the death of Global Warming after all. Just ordinary Pacific Ocean patterns on top of the well-established warming trend. Speaking of warming, where does Dr. Pielke in his thoughtful scientific way declare that the “missing” heat has gone? He speculates that it was magically transported into space. In other words, he has no idea. But it’s certainly more entertaining than considering good old-fashioned ocean currents. This entry was posted in Half of the Story, I wouldn't have seen it if I didn't believe it, The Cherry Orchard and tagged Chart cheating, Cherry-picking, Sneers by Ben. Bookmark the permalink.